In Argentina every child learns that those islands off the Atlantic coast are called las Malvinas and not The Falklands. They learn that these islands belong to Argentina and that the United Kingdom stole the islands during a war of aggression in the early 1980s. April 2 is a public holiday in Argentina: Dia de los Caides en la Guerra de las Malivinas, a day to pay tribute to their fallen soldiers in a war that started on the same day in 1982. It began with a simple military occupation and ended 74 days later with over 900 dead (649 Argentines, 255 British and 3 islanders). The disaster of the war led to massive demonstrations against the military throughout Argentina and ultimately hastened the junta's downfall and a return to democracy in 1983. Throughout the country there are monuments to the fallen Argentine heroes of the war, and plaques in public buildings and shopping centres alike. Street art often addresses the Malvinas too, usually in highly patriotic fashion. The issue of the Malvinas often comes up in the politics of Argentina. The nationalism invoked is seen by some as a diversion from more important issues facing the country. 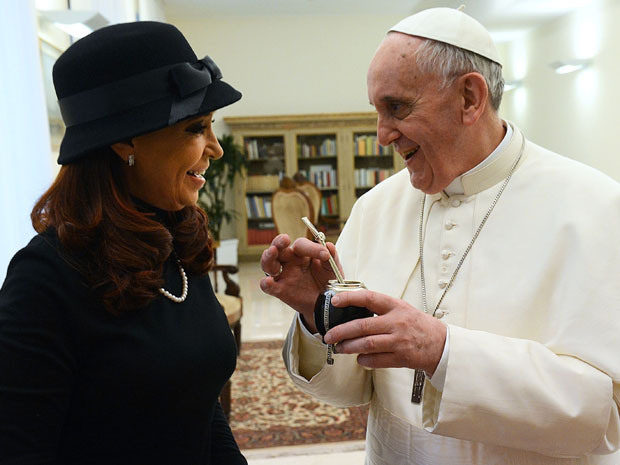 Lately President Cristina Fernandez de Kirchner has been trumpeting the Malvinas line, including asking the new Pope for some sort of holy intervention. While Argentine citizens would probably agree the islands do belong to Argentina, nobody would charge off to another war, or expend energy of any kind to get the islands back. There are more important issues facing this country. Including the rate of inflation. This morning what is called here the blue dollar, or the black market price for the American dollar, hit 8.75 pesos. When we arrived in early January it was about 6 pesos to the dollar. The official government exchange rate is just over 5 pesos to the US dollar, as it has been since January. As Argentina's inflation rate increases and the savings of its ordinary citizens disappear, the Malvinas rhetoric only seems to increase too, with or without holy intervention.